A man caught with a stun gun disguised as a torch at a Horsham nightclub has been let off without punishment because he had no idea what it was. Security staff at now-closed The Venue in Albion way noticed in October last year that a torch in Dawid Szczecinski’s bag doubled as a Taser-like weapon, a court heard today. Szczecinski, 24, was shocked and claimed not to know what it was. Lewes Crown Court was told he bought it from a Polish website that apparently made no mention of its sinister dual function. 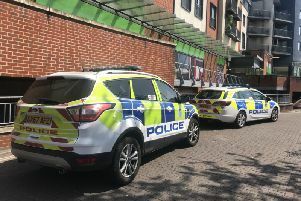 Szczecinski, of Goldstone Road in Horsham, pleaded guilty to possessing a prohibited weapon and was sentenced at Lewes Crown Court today. Prosecutor Amy Packham said: “Mr Szczecinski had attended the nightclub on October 28 last year and had with him a bag. This is an extremely unusual case. It seems perfectly possible you did not know you were carrying this weapon. But one of the staff later noticed that the torch might double as a weapon, suspecting a Taser. The police were called and Szczecinski was arrested. Body worn video from the police officers who arrested him shows Szczecinski being visibly shocked when told that his torch was a weapon, the court heard. The court heard from the probation service, who said Szczecinski told them he had had no idea the item was anything other than a torch. Szczecinski, who had been living in the UK for three years at the time of the offence, had bought the torch from a Polish website when he was visiting family in Poland. He had only brought it with him to the club because his route through the park was dark, the court heard. Defence counsel Judie Kemish said: “One can purchase these torches in Poland. She told the judge that Szczecinski had learned his lesson and knows he needs to be more careful about buying things on the internet. Sentencing him, Judge Christine Laing QC said: “This is an extremely unusual case. “Possession of any weapon is a very serious offence but it seems to me perfectly possible to find that you did not know that you were carrying this unlawful weapon. “It was only because some sharp eyed security guard had seen something similar that it was found. Judge Laing decided not to jail him and instead gave him a conditional discharge. As a result Szczecinski will receive no further penalty, so long as he commits no further offences. The Venue is now closed down and the building has changed hands.